Everything you need on the main level! Fantastic open great room with vaulted ceiling and beautiful wood flooring joins the Living Room, Dining Room and Kitchen with breathtaking Pikes Peak views through the wall of windows! Prepare meals in the gourmet kitchen while visiting with friends at the dining room table and others enjoying the gas fireplace in the living room. Two bedrooms and a full bath on one side of the home; Master Suite on the other side. Master Suite boasts tray ceiling and en suite bath with soaking tub, double vanity, glass shower and large walk-in closet. Main level laundry room has utility sink and ample cabinets. Downstairs family room with surround sound includes an 8x8 wet bar area with sink, granite counters and cabinets. Desirable corner lot in the prestigious Flying Horse community with low HOA fees. 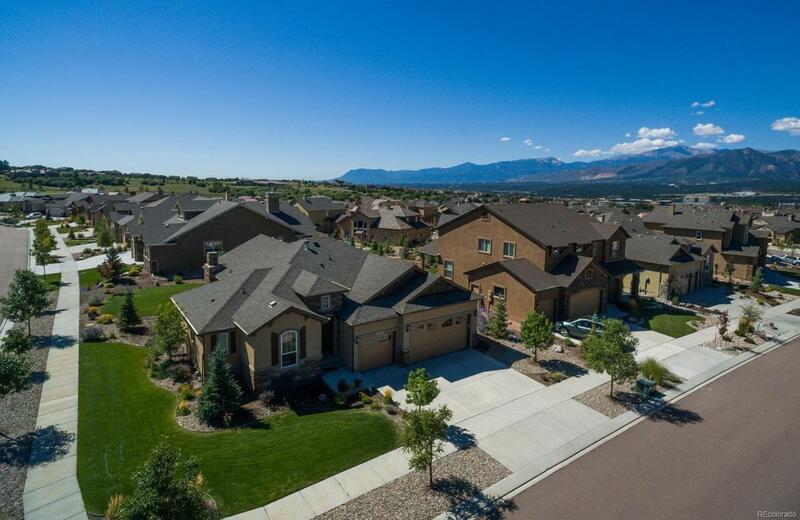 Classical Academy, Discover Canyon Schools, trails and golf course nearby to fully enjoy Colorado living!